News of the footprint discovery first came out with the publication of the 1961 classic creation book The Genesis Flood, complete with clear photographs.2 Dr. Clifford Burdick had initially researched the Paluxy find, and soon others came to help, most particularly Stan Taylor, director of Films for Christ. Over the next few years, Stan excavated many tracks and trails of both dinosaur and human-like prints, carefully documenting the discoveries on film to eliminate any charge of fraud. Both my father, Henry M. Morris, Ph.D., and I became nominally involved as the film Footprints in Stone was being finalized in 1973.3 The movie, suitable for showing in churches and schools, convinced many that evolution was indeed a false premise. In 1975 and afterward, I was able to continue the research while on the faculty of nearby Oklahoma University, resulting in the 1980 book Tracking Those Incredible Dinosaurs (and the People Who Knew Them).4 This book contained many detailed photographs and maps and a sound geological interpretation. It was not only accepted by Christians, it infuriated evolutionists. The Glen Rose Limestone, in which the prints rest, is several hundred feet thick and covers much of the southeastern North American continent. Conventionally dated as Early Cretaceous (supposedly around 100 million years old, nearing the end of the “age of the dinosaurs”), it not only contains abundant dinosaur prints, but is often recognized in drill cuttings by a plethora of carbonized wood chips throughout its composition. The Cretaceous is near the middle of the geologic column, and resting below the Glen Rose Limestone are many thousands of feet of sedimentary rock from an earlier time. Creationists interpret the sedimentary strata as having mostly been deposited by the great Flood of Noah’s day. In general, the deeper strata are from early in the Flood, the middle layers from the height of the Flood, and the upper strata from its waning stages. Surficial layers often date from the post-Flood Ice Age. Thus, the Glen Rose Limestone dates from several months after the beginning of the Flood. By this time, the floodwaters had already fully transgressed the continents, washed over them, and then returned several times, depositing and eroding with unimaginable fury.5 Evidently some hearty, water-resistant dinosaurs had survived until this point and were able to leave their prints as fresh mud was sporadically exposed. Conversely, it is difficult to imagine how humans could have survived this long while the Flood was in its most active stages, transgressing and regressing. The water depth ran rather shallow when the lime mud was deposited, and the flood-toppled trees sometimes scraped bottom, leaving branches and bits of wood behind. Samples of the wood have been carbon dated. Of course, carbon dating could never support the standard evolutionary date of 100 million years. Radioactive carbon decays too rapidly to ever intimate even 100,000 years. Instead, the dating of Glen Rose wood specimens yields an apparent age of only a few thousand years, a date compatible with biblical chronology. Examining the vast variety of individual prints at the Paluxy site impresses one that they were not made at a quiescent time when perfect prints would be expected. Water flowed rapidly in a high-energy environment. Animals were probably exhausted as they fought vainly for their lives. Soon all land-dwellers not on the Ark would die, but when the Glen Rose sediments were deposited and soft, apparently some were still alive. The Institute for Creation Research team of researchers scoured the river for miles up and downstream for more tracks. Numerous dinosaur prints and trackways were found and studied. An array of shapes could be seen, even in the same trail. The human-like shapes seldom showed all the features of a human foot. The general shape was only interpreted as possibly human because researchers knew of no other creature that could make such a shape. The presence of a trail of prints, with regular stride, an appropriate stride length, and a common ratio between length and width, carried greater weight than a “better” individual print displaying all the potential features. 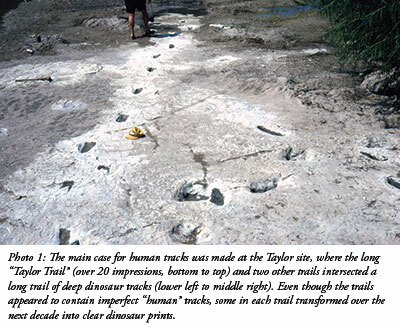 Trails of multiple human-like prints often crossed or overlapped trails of clear dinosaur prints. At the time of the publication of my book in 1980, the other researchers and I felt comfortable in interpreting them as possible human tracks. In 1982, the American Humanist Association commissioned four well-known anti-creationists to frequent the Paluxy in an endeavor to refute my book. Meanwhile, I continued to do research. Through their efforts and my own research, it became obvious there was a problem, and in 1984 I concluded we had most likely made an error. 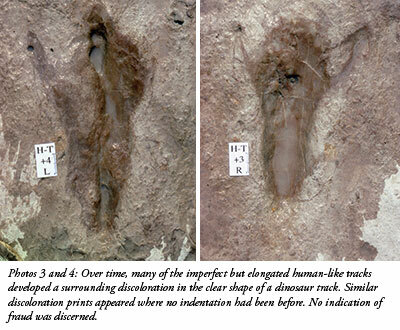 It was erroneous to claim the human-like prints were probably human. The change in our evaluation was prompted by a change in the tracks themselves, occurring several years after the prints had first been discovered. Many of the human-like prints developed “ghost” overprints surrounding the elongated foot shapes. While the human-foot shape remained indented, it was enveloped by a striking three-toed dinosaurian shape with a distinctive rust color, different from the gray limestone.6 The coloration was typically not indented, and indeed could not be felt. Furthermore, colored dinosaur-print shapes appeared in areas where there were no prior print impressions. Our chemical analysis confirmed that the colored areas contained more iron inside than outside, and we could find no evidence that any foreign chemical had been added. Evidently, the new prints were real. The colorations were hardly visible, if at all, in earlier days, and we had mistakenly interpreted the vaguely human-like shapes as being of human origin. 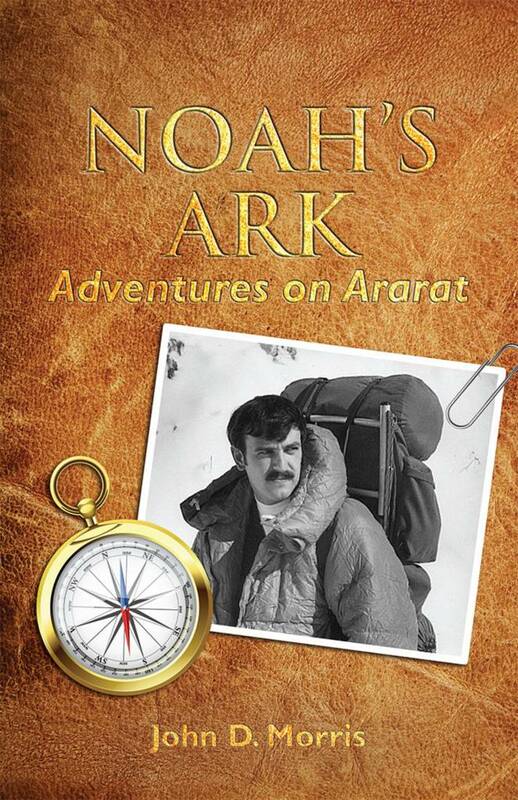 ICR responded with integrity and pulled my book off the market, as did Films for Christ with their documentary film. The tracks in question were more likely poorly formed dinosaur tracks, random erosion marks, or deliberate alterations to the original tracks. We looked diligently for evidence of foul play, but as yet no direct evidence of evolutionary fraud has been uncovered. Christians respect the truth, and the truth is, the tracks are too ambiguous to make a clear determination. ICR holds rigorously to the view that dinosaurs lived at the same time as man, but feels that the Paluxy may not provide useful evidence for this. Others hold different views, and ICR encourages them to continue searching for evidence that could convince a skeptic. Meanwhile, we continue to study. Now, nearly all the prints have eroded and are gone. The state of Texas founded Dinosaur Valley State Park, but maintains access to very few dinosaur prints, disappointing many visitors. Meanwhile, the city of Glen Rose has grown and only with a personal guide can the remaining sites be found. A clear understanding of how the prints formed and became altered has as of yet evaded this researcher, and it remains a grand mystery. But the story isn’t over. A recent re-evaluation of a classic dinosaur print site in Australia presents evidence and an interpretation remarkably similar to that required by the Paluxy River data.7,8 This investigation suggests that the sediment was laid down by rapidly flowing water, and that the trackways generally follow the water-flow direction. Water depth varied greatly. Sometimes the dinosaurs were wading in shallow water, while sometimes they were swimming with the current, occasionally touching bottom. The trackways often appear and disappear, indicating that sometimes the dinosaurs were completely carried along by the water. Often the prints are deep, while in other cases they are shallow—all very similar to those at Paluxy. 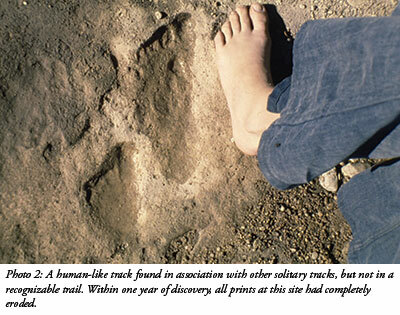 Most remarkable are elongated “human-like” shapes in the center of three-toed prints, indicating the presence of a central “pad” that left a mark under rare conditions. Could a similar rare set of circumstances be responsible for the human-like shape within so many of the large dinosaur prints at Paluxy? We may never know. Just as the Paluxy prints are irreversibly eroding, revealing more or less information as they disappear, so the prints in Australia are fading. Sometimes truth is stranger than fiction. Meanwhile, my evaluation of the Paluxy footprints remains the same. They are too ambiguous to be used as an anti-evolution argument, but they just might be coming into their own as good evidence for Flood catastrophism. Milne, D. H. and S. D. Schafersman. 1983. Dinosaur Tracts, Erosion Marks and Midnight Chisel Work (But No Human Footprints) in the Cretaceous Limestone of the Paluxy River Bed, Texas. Journal of Geological Education. 31 (2): 111-123. Whitcomb, J. C. and H. M. Morris. 1961. The Genesis Flood. Phillipsburg, NJ: Presbyterian & Reformed Publishing Co., 167, 174. Taylor, S. E. 1973. Footprints in Stone. (Film.) Produced by Films for Christ, Inc.
Morris, J. D. 1980. Tracking Those Incredible Dinosaurs. San Diego, CA: Creation-Life Publishers. See Morris, J. 2012. 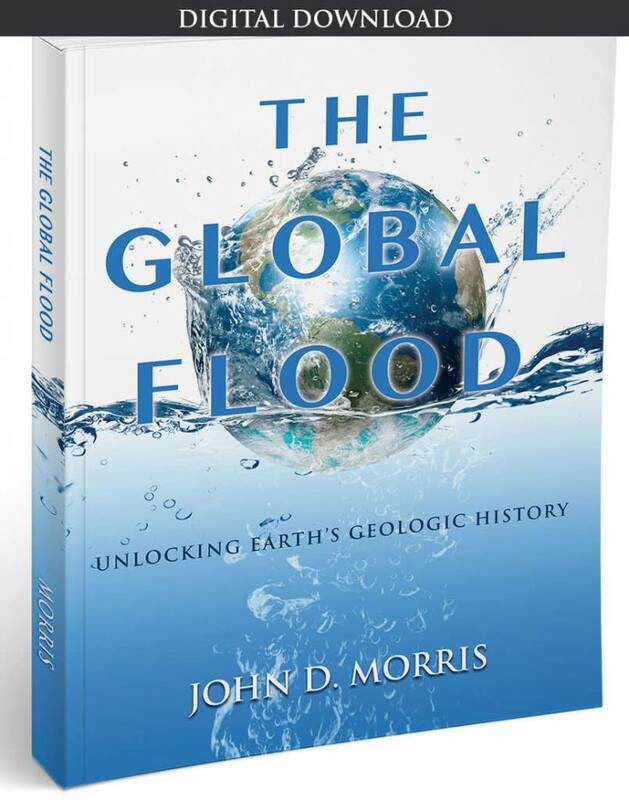 The Global Flood: Unlocking Earth’s Geologic History. 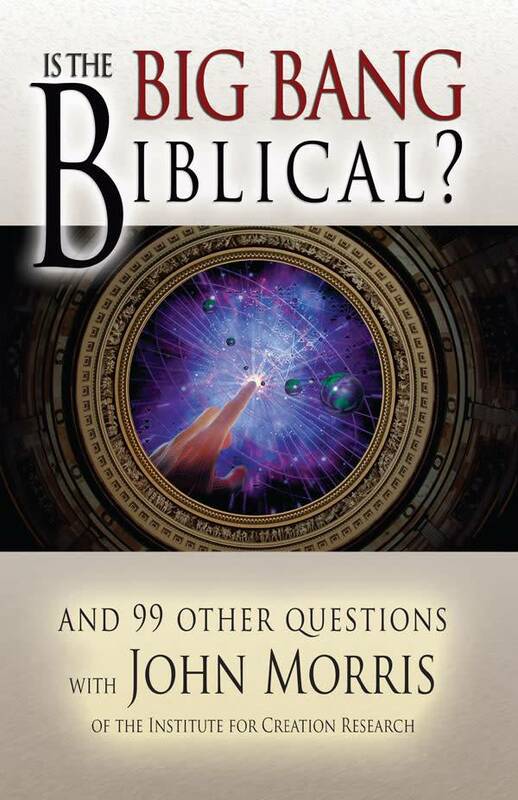 Dallas, TX: Institute for Creation Research; and Morris, J. and J. J. S. Johnson. 2012. The Draining Floodwaters: Geologic Evidence Reflects the Genesis Text. Acts & Facts. 41 (1): 12-13. Morris, J. D. 1986. The Paluxy River Mystery. Acts & Facts. 15 (1). Cite this article: Morris, J. 2013. Paluxy River: The Tale of the Trails. Acts & Facts. 42 (5): 12-14.